Ohh, I love the angles and curves of this. Beautiful! Thank you. They were difficult… really…. but lots of fun. Thank you. It became more a more much after the fact. the architecture of discovery , great as always. Do you get shy drawing in front of people Barry? You know, I really thought I would be. After so many public sketches, I don’t even think about it anymore. Most people are complimentary and only want to be “part of” the experience. You’ve managed great perspective but with a whimsical inviting style. Very Harry:) Love it! 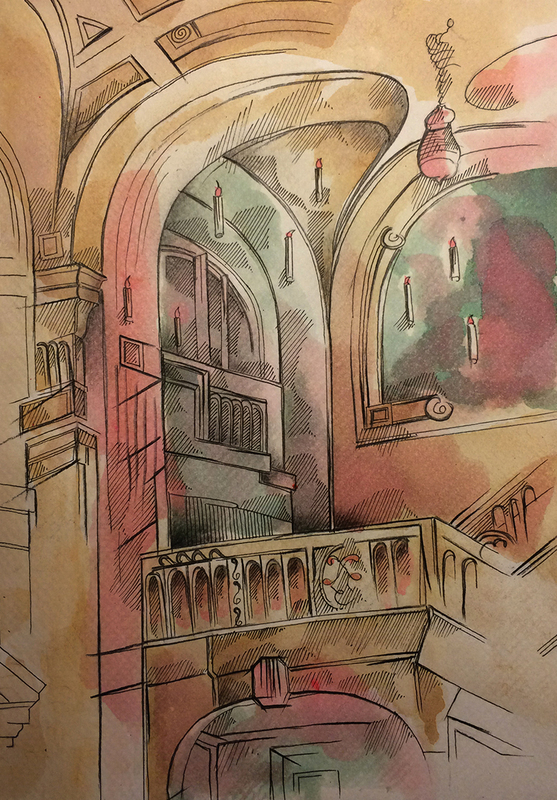 Oh nice to notice… the library is vaulted and sort of retro-gothic, but I had to exaggerate just a little to give it a “feel”. Big, huge smile. Thank you. Wow! This is straight out of Harry Potter, wonderful. Thank you so much… I labored to find a “note”. Fabulous! I wish I could have been there too … your sketch takes me. Thank you Cindy. BTW, when are you going to try the Dr. Martins?